Go on the graveyard at night without using the undead unguent to be killed by the ghosts. The death message refers to artist Kenn Nishiuye. - The man selling mysterious objects at the upper left of the screen says "If you wish to know more, you must seek out a sage man, such as Kenn of Nish or Alfred of Roughton." 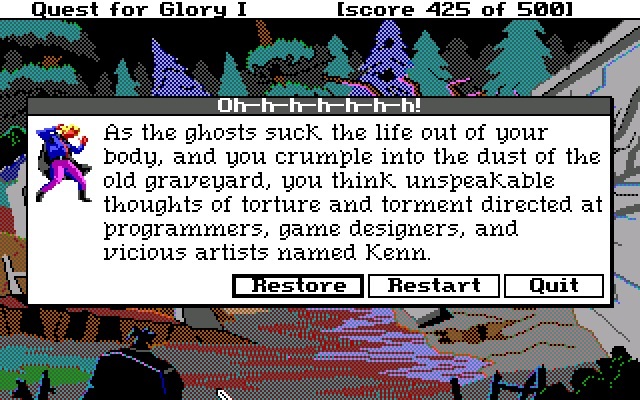 Ken of Nish refers to art designer Kenn Nishiuye and Al Roughton is an animator/artist of the game. - The man at the cider barrel is named John Chapman. It is most likely a reference to the John Chapman who produced Chapman's Map of Nottinghamshire in 1774, the earliest printed map at a sufficiently useful scale.